Soon after I discovered astrology, I was working in therapeutic community on the edge of Dartmoor. The clients were teenagers with educational and social needs who had been referred by social services. Their previous experience had been in lock up situations in major cities. This community had a whole food ethos and an open door policy. There were no locks, but this worked surprisingly well. Naturally several of the kids tried to do a runner, but being lost on the moor soon dampened their enthusiasm for escaping. Most of the carers were hippies ( it was in the 1970s ), so you can imagine what the clients thought about us. But there was one who naturally commanded big respect from all of them. This guy had cycled right round the world, canoed the whole of the River Nile and while I was there completed a marathon without doing any training at all. He used to take the teenagers out on survival missions on Dartmoor overnight. In those days I would always ask for someone’s Sun sign, sometimes even before knowing their name. This guy was a sceptic and it pleased him no end to confound my beliefs by declaring himself to be a Pisces. My understanding of the subject being pretty limited and one dimensional at the time, I could not comprehend it. How could he be one of those vague, wishy washy, hyper sensitive, mystical, head in the clouds types. The only thing that appeared Piscean about him was the emphasis on his feet, which were enormous and seemed determined to cover every inch of the globe as quickly as possible. While spending my year in this community, I managed to acquire the arcane skill ( it seriously was in those days ) of constructing a chart and found out that my friend and colleague had a very close Sun / Jupiter conjunction as part of a stellium in the 9th house some of which were in Aries. He also had Leo with Pluto rising. At about the same time my astrological reading had led me to discover planetary rulerships and the difference between traditional and modern ones. So much of astrology weaves beautifully around the concept of numbers and balance. The 12 signs fit lovingly into 3 sets of 4 elements, the 12 houses reflect that and the aspects fit in perfectly. The only issue for the ancients could have been how do we work out 12 signs and the 7 visible planets ? No problem, the Sun and Moon are so obviously different from the rest that we give them one each and the others can have two. Since then the discoveries of Uranus, Neptune and Pluto have nicked Aquarius, Pisces and Scorpio and there are plenty of astrologers prepared to put Ceres up for Virgo. Traditionalists, much like classical music buffs who claim there’s been no good tunes since 1750, dismiss these discoveries and carry on with the old rulerships. Capricorn Research just goes by results. Uranus, Neptune and particularly Pluto have performed so magnificently in the transits stakes of just about every chart I’ve ever seen that of course they should be given signs of their own. But have they got the right ones ? Pluto, yes no question. Scorpio is such a magnificent fit that Mars has surely lost the biggest battle of its life. If there existed an archetypal Aquarian character, they would surely be handed over to Uranus. But in Capricorn Research’s experience, many Aquarians are not at all Uranian. They certainly like to think they are, but that’s another matter. Capricorn Research has a collection of over 25,000 timed birth charts of famous people that has been divided into different groups mostly based on choice of career. Its interesting to see which groups have the highest scoring Sun sign. Aquarians would no doubt identify with Comedians like Eddie Izzard who has a 6 planet stellium in the sign. And its true that Aquarius is by far the most common Sun sign in the charts of my 328 Comedians. However the other groupings where Aquarius scores highest are Politicians, Rulers, Armed Forces and Nazis. So should Aquarius be ruled by Uranus or Saturn ? Lots of Horary Astrologers would definitely say the latter. But given how they seem to have ensconced themselves at the top of such powerful and even downright nasty groups, perhaps we should take care to appease them. Safer to say Uranus and keep your fingers crossed. Maybe we’ll just say the jury’s still out and go for joint rulership. But Pisces is surely Neptune ? They were made for each other. The last sign is so complex and so difficult to pin down that the old powers that be just probably gave up and handed it over to Jupiter anyway. How much does the super sensitive empathic Piscean personality have in common with the direct tell it like it is like it or lump it Sagittarian ? On the face of it not very much. But both signs are fundamentally about journeys. Sagittarius obviously so but as the last sign of the zodiac, the Piscean journey is one we all have to make sooner or later. It is the journey of the ending of the self. There are no maps to read, no signposts pointing the way. It is the place that Shakespeare called ” the undiscovered country, from whose bourn no traveler returns “. One man who willingly and heroically took this journey was Captain Lawrence Oates, a member of Scott’s ill fated expedition to the South Pole. Oates’ journey was suitably ruled by both Jupiter and Neptune. He was afflicted with gangrene and frostbite and aware that his health was compromising his companions’ chances of survival. He walked out of his tent into a blizzard to his certain death. A birth chart is a symbol of a person’s whole life, but if that individual is well known for a particular act, that one thing will be indicated strongly in the chart. 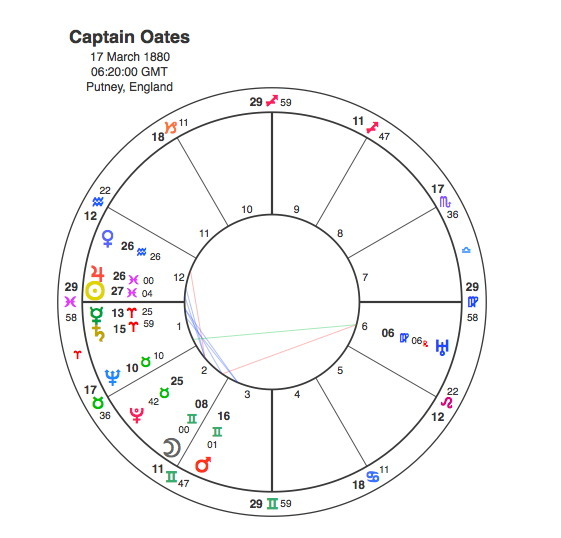 Oates was an explorer and has the Sun closely conjunct Jupiter but it was his final journey from the tent that is so clearly depicted in his chart. The Sun is at the end of Pisces and his Ascendant marks the final minutes of the Zodiac’s tour of life. The Sun is also at the very end of the 12th and final house. The symbolism could hardly be clearer. On March 16th 1912, when Lawrence Oates went outside, Pluto was stationed at 26 degrees 57 Gemini, exactly square to his Sun. Even the quote which he is remembered for is shown in the chart. Mercury is in Aries ” I am just going outside “, conjunct Saturn ” and may be some time “. When you have astrology, few words are needed.